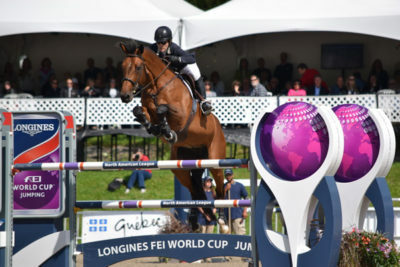 At the end of the busy World Cup qualifying season, the leading Canadians in the North American League jumping standings heading into the FEI World Cup Finals in Paris, France, April 10-15, 2018, were Isabelle Lapierre in the Eastern sub-league (7th place) and Ali Ramsay in the Western sub-league (6th place). Karen Hendry-Ouellette, Manager of Sport-Jumping at Equestrian Canada, stated that both have declined to attend this year’s Final. In Dressage World Cup Final news, Canadian Brittany Fraser with All In were 4th on the North American league list with a qualifying score average of 75.750%, but only the top two from the NAL may participate, which was led by Laura Graves and Verdades (84.825%) and Shelly Francis with Danilo (76.937%). For more information, participants and schedules, click here.